Everyone’s been talking about the benefits of green juice – and for good reason. These brilliantly-colored vegetables make for a powerfully nutritious juice. But I’ll be honest with you – green juicing is not as easy-peasy as the green juice fanatics make it out to be. For starters, leafy greens have a slightly longer lifespan than fruit flies. Even shorter if the greens are organic. If you want to juice leafy greens on a regular basis, be prepared to become a regular at your local organic market or grocers. To add to that, there’s prep work involved. Unless you have a Lettuce Keeper, you’ll want to wash your leafy greens just before you juice them – meaning you’ll be chopping and washing and disinfecting each time you juice your greens. Tip: Get thee a Lettuce Keeper. The amount of time it saves you – and keeps your leafy greens fresh – is so worth the $10. But despite all the hassle and fuss – green juicing is worth it. Oh, it is so, so worth it. It clears your skin. Your cravings subside. It gives you calm, focused energy. It gets rid of your body odor. You lose weight. It powers your workouts. You get sick less often. Your skin glows. And it actually tastes lovely. #1. Why are Green Juices So Great? “Eat your greens” – you’ve probably heard this ever since you were a kid. And there are sound reasons behind why your mom insisted so much. For starters: Leafy greens are crazy alkaline. That is a very good thing since the ideal pH we want to keep for optimal health is around 7.365 – which is slightly alkaline. Maintaining this balance shouldn’t be a problem, except most of us live very acid-forming lifestyles. We eat acid-forming foods. We stress. We’re exposed to toxins on a daily basis. And an acidic environment – once formed, is a hotbed of disease as the acidity makes it more difficult for our bodies to fight off parasites, viruses, and disease, leading to chronic health issues such as joint pain, digestive problems, and even allergies. Green juices are an easy way to alkalize our bodies and effortlessly balance out the acid-forming conditions most of us are chronically exposed to. But alkalinity is just the tip of the green juicing iceberg – find out even more benefits of green juice! #2. How Do I Start Juicing Leafy Greens? But a few tips and tricks never hurt. 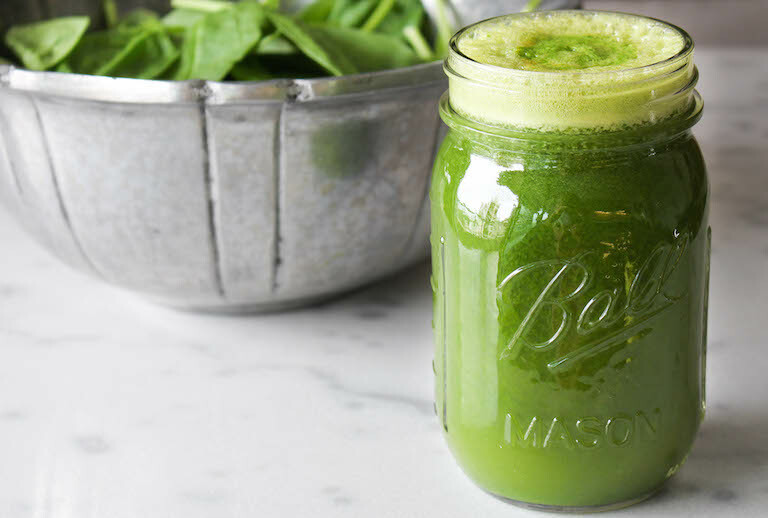 Check out our tips for making the perfect green juice – you’ll find some tricks that’ll help you get the most juice out of your juicer, ways to make your green juice taste yummy, and juicing mistakes to avoid! Once you know how to juice leafy greens – you’ll also want to know the “best practices” for green juicing in the healthiest way possible. #3. What are the Best Juicers for Leafy Greens? Some juicers just don’t do justice to leafy greens. If you’re planning on juicing mostly leafy greens – avoid centrifugal juicers and opt for a masticating, twin gear or cold press juicer. You can read our reviews of the best juicers for leafy greens here. Going for these slow juicers will give you the highest quality juice and allow you to store your juice for longer periods of time, which is perfect if you’re planning to juice on the go. Oh, and if you’d like to give green juicing a try before investing in a juicer – you’ll be happy to know you can do that (‘though you need to have a blender or a food processor). You will eventually want a proper juicer to be able to juice the widest range of fruits and veggies and get the best quality juice, but in the meantime, you can test out juice recipes and find out what all the hullabaloo is about for yourself! Here’s an easy way to make green juice without a juicer. #4. What are the Best Greens to Juice? The best greens to juice are…a wide and varied rotation of all the greens nature has to offer. Each and every green veggie has something going for it, as you can see in our list of leafy greens to juice. Making sure that you are including a diverse selection of them in your green juices is the best way to make sure that you’re consuming all the beneficial phytochemicals that each of them have to offer. Plus, rotating your greens prevents you from getting too much of the anti-nutrients vegetables naturally contain. See a list of leafy greens! Just remember that as nutritious as many of the leafy greens can be, they can come on a little…strong…at first. Start slow with light, easy-to-take greens like cucumber, celery, and lettuce. Then, once your body adjusts and you get used to addicted to the taste of green in your diet, you can widen your green exposure with these super-greens! Want some great green juice recipes to get started with?